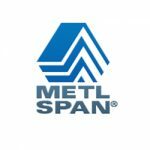 Since 1968 Metl span has been pioneering research, design and production of state-of-the-art building envelopes in insulated metal manufacturing. Their Texas location provides us with reasonable lead times to west coast dock. Any commercial or industrial application for insulated metal wall or roof panel can be engineered to fit your needs. With over 25 different panel profiles varying in insulation properties and finishes from single-skin wall panels to stucco-like Architectural retail suites– we have the engineering you need to accomplish the long-term goals of your most discriminating clients. With matching accessories and roofing panels we can accompany your windows, columns, sunshades and grilles to accomplish the whole project under one manufactured envelope.